Played two, won two, scored five, conceded none, and both games in challenging London derbies. Tottenham’s start to the Premier League season under new manager Mauricio Pochettino could not have gone better. Wins over West Ham then QPR leave them top of the table before the third round of fixtures, in which Liverpool visit White Hart Lane on Sunday. 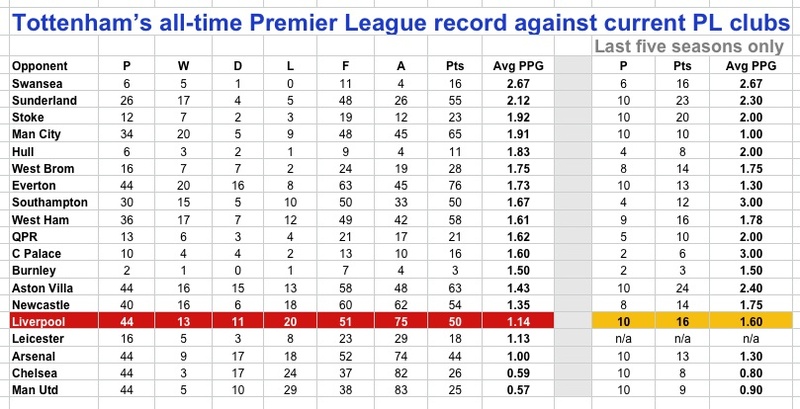 Spurs in the Premier League era have moved from being a club who finished, on average, just outside the top half of the table for the first half of the League’s existence, to being a top-six side, for the past five seasons anyway, and for seven of the past nine seasons. Yes, they have slipped from fourth to fifth to sixth in the last three years but the core stability is there and Pochettino has been hired to reverse the small recent slippage. Liverpool are one of the teams against whom Spurs have an improving record over the last five seasons, as the second graphic shows. Their 22-year average points haul in PL games against Liverpool has been just 1.1 points per game. More recently, the last five years, that has risen to 1.6 points per games, in spite of Spurs being on a run of three straight clobberings by their Merseyside opponents: 2-3 in March 2013 and 0-5 and 0-4 last season. In the seven games before that, Tottenham won five, drew one and only lost one to gain their 16 points.